"Looking for a mirror in Cheadle ?" "
"Mirrororworld have 1000's of mirrors and years of experience delivering mirrors to the whole of the UK including Cheadle, We Supply and manufacture mirrors for the home and work place, whether your looking for a simple mirror for your bathroom, a cheval for the bedroom or a statement mirror for the lounge, Mirrorworld are the one stop mirror resource. With 1000's of ready made mirrors to choose from and an award winning made to measure service, it's easy to find that desired mirror here at mirrorworld. Check out our online store or try one of our free quote tools for a perfect custom made to your exact requirements. With a nationwide delivery service you really don't need to look further for a beautiful mirrors at a great prices." "Mirrorworld are the experts when it come to mirrors for Cheadle, large or small, framed or unframed, customised and made to measure, we do the lot, whatever your needs look no further. check out our extensive on line catalogue or one of our free online designer tools, we know you'll find the perfect mirror for you. With free delivery anywhere in the UK mainland on orders of £50 your perfect mirror is just a few click away." BC013 Just one of the great selections from our Art Deco range of mirrors and accessories. Beautiful Handcrafted mirror made in a traditional manner to a very high standard. This mirror has to be seen to be truly appreciated. At Mirrorworld we pride our selves in delivering quality mirrors and services throughout the UK, including Cheadle. MU092 Just one of the great selections from our Children Fun Novelty range of mirrors and accessories. Our funky Stegosaurus Dinosaur mirror with it's array of plates and spikes is a stunning feature on it's own, or theme it with our three other dinosaur mirrors for a real 'Jurassic Park' scene. Boys will love this mirror. Made from high quality 3mm acrylic mirror. All products are supplied with adhesive pads and instructions for use. NOTE: All products have a protective film covering the surface. Please remember to remove the film carefully to reveal the high quality reflective surface. See instructions for use. All prices include VAT Made from high quality 3mm shatterproof acrylic mirror. All products are supplied with adhesive pads and instructions for use. NOTE: All products have a protective film covering the surface. Please remember to remove the film carefully to reveal the high quality reflective surface. See instructions for use. DR140 Just one of the great selections from our Designer range of mirrors and accessories. 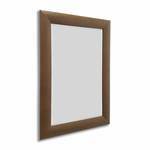 Sophisticated and Stylish Mocha and Gold fabric covered Frame with bevelled mirror. This mirror looks fabulous hanging in either the landscape or portrait position, either alone, above a sideboard or mantelpiece. Adding the wow factor to your modern room. Passionate about our products and service, we want to help you make the perfect choice; so, in addition to holding a wide variety of mirrors in stock, we also offer a number of bespoke services. Perhaps you are looking to whet your artistic appetite or for our professional creative input; MirrorWorld’s accomplished craftsmen will work closely with you to create your own personal design, by hand at our workshop and deliver it to your Cheadle home.